'I have vowed to live under Christ, to live under Christ alone, to reign under Christ alone'. Although St Edmund has been the patron-saint of England for well over a thousand years, he has gradually been sidelined and today, in this land without saints, he is almost forgotten. Indeed, ever since the definitive establishment of the Normans in this country in the twelfth century, he has come to be neglected. Just as the Normans attempted to replace popular veneration for the Righteous English King Alfred with their fairy-tales and myths of the Non-English King Arthur, so they also tried to replace the memory of the English St Edmund with their crusaders' version of St George. Edmund (Eadmund) was born on Christmas Day 841. Christian from infancy, in 856 he succeeded to the throne of what was perhaps the cradle of the English Nation in East Anglia. During his brief reign he came to fight alongside the future King Alfred in order to defend England from the invasions of the pagan Vikings. In 869 a great Viking army landed on the shores of his kingdom and Edmund marched out at the head of his army to defend the realm. The King was defeated and captured. In captivity he was ordered to renounce his faith and become a vassal of the heathen Danes, orders which he stoutly rejected. Repeating the name of Christ with his heart and his lips, he told them: 'Living or dead, nothing shall separate me from the love of Christ'. He was tied to a tree, tortured by being shot through with arrows, and then beheaded. His martyrdom took place on 20 November 869 at Hoxne in High Suffolk and his body was buried in a small wooden chapel nearby. In 902 the relics, still incorrupt, were translated to Bedricsworth, at the very crossways of the four counties of Eastern England - Norfolk, Suffolk, Essex and Cambridgeshire. This town soon came to be called 'Edmundstowe', 'Edmundston' and finally was renamed Bury St. Edmunds. 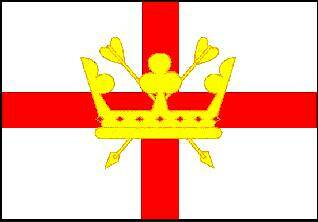 From this time on St Edmund became a local, and soon, national patron. In 929 the humble pilgrim King Athelstan founded a community to care for his shrine. In 945 another royal grandson of King Alfred, called Edmund, gave them further lands. St. Edmund had become the ideal English hero, a king and a martyr. The last purely English King of England, Edmund Ironside (+1014), was also named after him. In 1020 a monastic church was built over his shrine by King Canute and this was served by monks from Ely. Even after the final Viking Invasion and Occupation of 1066, the martyr's relics were placed in a refurbished shrine in a new church in 1095 and they continued to be a place of national pilgrimage. However, in 1199 the French King of England, Richard I, was to call at the tomb of St. George in Lydda, while on the Third Crusade. Invoking the saint, he won a great victory and consequently placed himself and his army under St. George's protection. St. Edmund, however, remained the national patron. Thus in 1214 the future Magna Carta barons, in opposing Richard's younger brother, King John, rode to Bury St. Edmunds on St Edmund's day to make a pledge at the altar of St. Edmund to strengthen the national cause. In 1215 the Magna Carta was signed by King John in the water meadows of Runnymede. As a result of this historic event the motto of Bury St Edmunds remains to this day: 'Shrine of a King, Cradle of the Law'. However, in the dynastic struggle after the hated King John's death in 1216, nearly all St Edmund's relics were stolen by French knights in 1217. They were taken to Toulouse in France and here they remained until 1901. The first consequence of this loss was that three years later, in 1220, St. George, already the personal patron of the sovereign, was inserted in the national calendar by Richard I's nephew, Henry III (1216-1272). Although the banner of St. Edmund was still carried by English forces in battle, by the time of Edward I (1272-1307) it had been joined by the banner of St. George. The eclipse of St. Edmund continued in the reign of Edward III (1327-77) with the founding of the Order of the Garter dedicated to Our Lady and St. George. The English veneration of kingship allowed St. George to usurp the national patronage, although his title was never patron but 'specyel protectour and defendour of this royaume' (special protector and defender of the realm). However, even as late as the reign of Richard 11 (1377-99), a fine representation of St. Edmund as a national patron was made in the Wilton Diptych. In this he was accompanied by Edward the Confessor and St. John the Baptist as personal patrons, and there was still no sign of St. George. Although in the reign of Henry VII (1457-1509), St. George was still only designated 'protector of the realm', it was under the Machiavellian tyrant Henry VIII (1491-1547) that St. Edmund became totally eclipsed. Henry actually removed St Edmund's name from the litanies of saints venerated in England and in 1539 he had the monastery at St Edmundsbury dissolved. Indeed after the Protestant Reformation, St George came to be one of the few saints to be at all known to the Protestant Church in England. Most of the relics of St Edmund (not the head-relic) were returned to the Roman Catholic authorities in England in 1901 and they are kept locked away at a private Catholic chapel in Arundel in Sussex. Exult, O Holy Church of the English; behold to Thee it is given to praise the illustrious king and most invincible martyr Edmund, who triumphing over the kings of this world, went up to heaven with great victory. O Holy Father Edmund, hearken unto those who pray unto thee. HOLY MARTYR EDMUND, PRAY TO GOD FOR US!